Ron Young uses a refractometer to test specific gravity in a battery. In part one of this article I discussed various topics including Solar Availability, Types of Mounting, Length of Wire Run, and Charge Controllers. The remaining two major components of your off-grid system are Inverters and Batteries. An inverter is a device that takes the stored battery power and changes it from DC (direct current) to AC (alternating current). AC is required for all your conventional household appliances and is what you get from the utility (BC Hydro). In the early days of off-grid systems, it was common to use DC appliances because inverters were very expensive. DC light bulbs are still available as are some other things, primarily supported by the RV industry. These days, inverters have come down dramatically in price and gone up in features so it really only makes sense to outfit an off-grid home with AC appliances, just like an on-grid home. The other consideration here is the cost of DC appliances is much higher. For example, a DC light bulb can cost $30–$50, if you can find one, versus the most efficient AC LED style light bulbs that you can buy for $15 or less. The exception to this rule is when choosing off-grid refrigeration and water pumping systems. Both of these appliances are heavy power users and a direct connection to the batteries can insure continuation of services if the inverter fails as well as giving you an increase in efficiency by not going through the inverter. There are several different types of inverters and it’s important to understand the differences so you are comparing apples with apples. The type of power output by an inverter can be sine-wave or modified sine-wave (square wave). This refers to what the power curve looks like on an oscilloscope. A sine-wave inverter gives much cleaner power, much like what you get out of the wall in an on-grid home. Sine-wave power is best for the many types of electronic devices we use today including computers, stereos, phones, etc. A mod-sine wave inverter is a rougher form of power that can cause noise and interference on some devices and although they are a little less expensive it is better to choose sine-wave except for the most basic applications. Nearly all of your big box store inverters are mod-sine because they are aiming for bargain prices. Most inverters for serious off-grid applications are inverter/chargers. The inverter/charger has a built in three-stage charger that is designed to optimize the charging of your batteries. If you do not have an inverter with a built-in charger you will need to buy a separate three-stage charger to do the job. If you use just an automotive charger you will only be charging your batteries to about 80 per cent of their capacity and this will result in sulphation and overall degradation of your batteries, shortening their life considerably. The inverter is the brain of your system and it’s important to understand the capabilities of the models you are considering. Modern day inverter/chargers should have a comprehensive monitor that will allow you to see how much power is being used, the state of charge of the batteries, access to the set points for battery charging, and some ability to log errors and faults should they occur. You may also want the ability to automatically start your generator when the batteries are depleted and view the status of the system online if you are away from your off-grid home. Lightning arrestors are an important option to consider for both the AC and DC lines to and from the inverter. I have discussed batteries in previous articles in this space and while the inverter is the brain of the system the batteries are the heart and worth serious consideration. Batteries come in many sizes and types and your selection of batteries is in many ways the foundation stone of your system. While price is always a prime consideration it shouldn’t be the principal decision making point. Batteries are the single most expensive component because they are consumables and have a given life span so you should consider the long view including the overall cost of batteries over the lifetime of the system. Another question you need to answer before making your battery choice is how much maintenance are you realistically willing to perform. There are many new battery technologies available but only a couple of them make any sense for most of us due to cost. Lead acid batteries, while requiring the most maintenance, are also still the best bang for your buck. The maintenance requirements for lead acid are not onerous but need to be performed regularly such as adding water, checking specific gravity readings of electrolyte, equalizing the batteries on a regular basis, and keeping the contacts clean and tight. The equalizing function is basically a controlled overcharge performed by the inverter or the charge controller; you just press a button and the device does the rest. Equalizing dissolves built up sulphates and prevents the battery capacity from diminishing due to increased resistance. One of the best tools for lead acid battery maintenance is a refractometer, which is used to check the specific gravity of the electrolyte (the combination of water and acid inside the battery). The optimum specific gravity of lead acid batteries is 1.26, which can be read by taking a single drop sample and putting it on the refractometer prism. As batteries discharge the specific gravity will drop and below a reading of 1.20 the battery needs to be fully recharged. You can’t rely on battery voltage to give you an accurate understanding of battery state of charge because a badly sulphated battery can still have a high voltage. If you are averse to battery maintenance, then you should consider another battery technology such as AGM (absorbed glass mat) or li-ion (lithium ion). The cost for AGM batteries is about 70 per cent higher than lead acid batteries so a significant difference but they are virtually maintenance-free and can be located in areas without ventilation as they are sealed batteries and no off-gassing or sulphuric fumes to worry about. Li-ion batteries are pretty interesting but still impractical for most off-grid applications. Elon Musk of SpaceX and Tesla Automotive fame is making a sealed battery pack of li-ion batteries but it requires specialized hardware interface that puts the price out of reach for now. Other li-ion sources are available from several manufacturers but given that these types of batteries require sophisticated battery management components (built in electronics) and can have failures resulting in serious damage to property and persons the jury is still out on these. Li-ion is definitely an on the horizon technology to watch but having seen the experience of people with hoverboards in recent news stories we want to exercise caution for now. Ron Young is a renewable energy professional that designs and sells solar, wind, and micro-hydro systems. 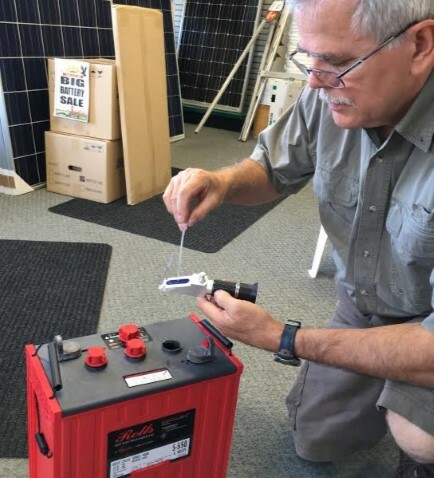 He operates the earthRight store in Williams Lake, BC and can be reached at info@solareagle.com – check out the Facebook page at earthrightsolar.